Hi! Candy here to share a new use for Glastique Finishing Glaze. Glastique Finishing Glaze is a water-based adhesive that has virtually no air bubbles, will not yellow over time and remains flexible. It comes in both gloss (which is also dimensional) and matte finishes. You can use it as a sealant or an adhesive. And, you can cover fall leaves with it! It changes them from brittle, dried up leaves to strong, flexible leaves you could hang on the wall or window or use to decorate any project you are working on. Choose freshly fallen, flat leaves for the best results and cover them with Glastique right away. I let mine sit in the house for a few days and they curled and dried a little too much. (I plan to do this again with fresh leaves). One cool thing I discovered ... because I left my leaves in the house for too long, they started to crack and break. When I covered them with Glastique, they became soft and pliable again. Very cool! To cover them, I laid them on my Non-Stick Craft Sheet, squirted a bit of Glastique onto them and then spread it around with a paint brush until each leaf was evenly covered. I let them dry, then flipped them and did the same on the other side. I love the shine of the Glastique Gloss Finishing Glaze, but if you wanted them to look more natural, opt for the Matte finish. And be sure to clean your paint brush right away -- otherwise all of your bristles will be glued together. Warm water cleans off the Glastique easily. 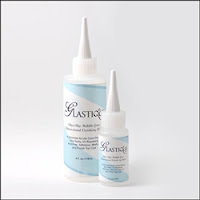 Love the Glastique - it's a great sealer and collage medium! I've used it several projects recently.